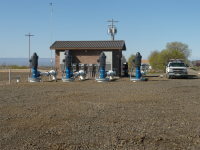 The work for this project consisted of constructing a PVC membrane lined irrigation water storage reservoir with approx. 300 acre-feet of capacity. 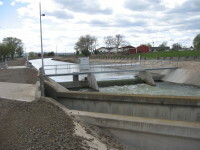 The design allows for water inflow from the adjacent canal through a motorized slide gate. Additional reinforced concrete structures include a ramo flume, inlet/waste way structure and a check structure. 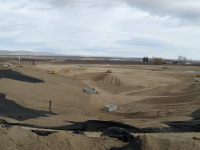 Work included a significant amount of earthwork, concrete structures, steel and HDPE pipe, PVC lining and electrical work. 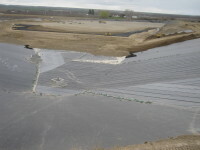 Use of the existing raw rock included overburden excavation and stockpiling and material screening, crushing, loading, hauling and stockpiling.